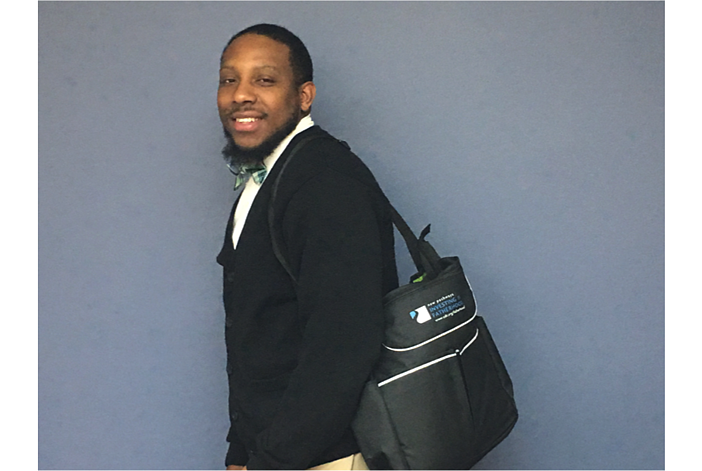 Pictured: Donovan Bridgeforth, CDR's newest Fatherhood Consultant with the diaper bag CDR distributes to new dads in the Rookie Dads programs. When we catch news of a fatherhood program doing great things for dads, we take notice. We especially take notice when they’re one of NFI’s Partners! Child Development Resources (CDR) of Williamsburg, Virginia was the recent focus of a news story in the Virginia Gazette Daily. They are one of several organizations to receive the federal government’s Pathways to Fatherhood grant from the U.S. Department of Health and Human Services Administration for Children and Families in late 2015. And boy, are we glad that they did! Without partners like CDR, NFI cannot meet its mission. We work to equip organizations across the nation like CDR with fatherhood skill-building resources and training to run effective, sustainable fatherhood programs. Partners like CDR also help us reach our vision: for every child to grow up with an involved, responsible, and committed father. Fathers who participate in CDR’s Investing in Fatherhood program most often come as referrals from community partners such as the local Social Service office, hospitals, regional jail, local Reentry Council, and a result of internal referrals from their very own Early Head Start and Parents as Teachers Programs. Since receiving the grant, CDR has acquired a variety of NFI curriculum including The 7 Habits of a 24/7 Dad™ and 24/7 Dad® A.M. programs, and other low intensity resources such as Help Me Grow child development guides. They also invested in having many of their staff earn their Father Engagement Certificate™ and Effective Facilitation Certificate™. Recently, I connected with the CDR team to learn more about why they chose NFI as their father engagement partner. Amy Bornhoft, CDR’s Director of Training shared, “We’re so grateful to have NFI as a resource and support system for our staff working with fathers because we know the resources we are getting are high quality. NFI provides us with security and comfort in knowing their materials are high-quality and researched”. Amy and her staff also rely on NFI’s website for fatherhood related information statistics, and free resources. They also love the free and for-purchase downloadable PDF resources they can use immediately. Nick Corsi, CDR’s long-time Fatherhood Program Consultant shared that he, too, liked NFI resources because they’re a high quality product. “They’re backed by research and easy for fathers to use without becoming overwhelmed. We also use the 24/7 Dad® program in groups in home visits to engage fathers and father figures”, said Nick. We’re thrilled to see CDR’s success and wide use of NFI materials. What do we think is extra special about CDR’s fatherhood program? They equip expectant fathers who complete the Rookie Dads class with a diaper bag specifically designed for dads containing a receiving blanket, changing pad, rattle, hand sanitizer, wipes, dad and baby book. They also include educational resources for new dads from NFI, specifically, The Importance of an Involved Father brochure and the New Dad's Pocket Guide, among others. Genius! For more information or to speak with a CDR Fatherhood Consultant, visit cdr.org/fatherhood or call 757-378-3177. You can also contact Child Development Resources at 757-566-3300.